First, as with all companies, PE companies need to get their own people management right. More than in most industries, people are the major asset. Whether in building funds, sourcing and completing deals or managing the portfolio of investments, success is uniquely dependent on the quality and effectiveness of the management team. As the Private Equity market evolves, people management needs to evolve as well. Maximum financial returns are best ensured by developing and implementing a people strategy that is designed to deliver the current investment strategy. Recruitment, executive compensation, organisation design and talent development will all be key components. PB PE can help identify the key opportunities to improve returns and where appropriate design and run programmes to deliver the benefits. Second, PE companies should also have a people management strategy for the management of their portfolio of investments. The nature of this will depend on where the PE business strategy sits on the active-passive investment spectrum, but should always take into account the potential to use the experience and expertise developed through multiple investments to help the performance of individual investments. There is a wide variation in current practice in the co-ordination of the management of portfolio companies, including the people issues. Increasingly PE firms are employing dedicated specialists combined with a range of external / part-time advisers. Recruitment – a critically important activity where the development of the consistent use of best practice can deliver major benefits. Business activities which are rapidly evolving – such as the use of AI / machine learning and the development of agile working techniques. Benchmarking performance by (i) applying activities such as the same employee engagement surveys across the portfolio and (ii) developing a common set of HR metrics which make it easier to identify areas of excellence and concern. It is also important however that the investment teams who have overall responsibility for the performance of their companies are helped to develop their expertise in monitoring and managing portfolio companies. People Business PE helps PE companies to define the extent to which they want to seek synergies across their portfolio. Such efforts are increasing as it is accepted that valuable support can be provided to newly acquired portfolio businesses that speeds up their decision making and helps them learn from the experiences of previously acquired businesses. Among many other areas, we work on developing a people management strategy for individual portfolio businesses which maximises the chances of the growth strategy being delivered. Third, the PE company can recommend resources to individual portfolio companies. Individual companies may not have well developed HR functions or who simply want to access quality resources who have a proven track record with other portfolio companies. This can cover almost every aspect of HR including recruitment, leadership development, coaching and mentoring, HR policies etc. This third element is a “pull” strategy where the onus is on the portfolio company to ask for help as it sees appropriate. PE companies have three distinct people management challenges. Great investors are central to the success of any PE Firm. But investing is a long cycle business where it can take many years to truly know whether someone really is a money maker or not. The challenge is that PE is a desirable career choice and applicants are well drilled, bright, articulate and know most of the right things to say at interview to be convincing. Often candidates come from strong cultures, Investment banks, Strategy Consulting firms and other PE firms with very different investment approaches – how can you reliably determine who will be successful at your firm and thrive? PB PE has developed over many years a rigorous methodology for assessing investor candidates and testing them on the key phases of investing. This is achieved through structured interviews, case study assessments, psychometrics and simulations. It is rare to find the perfect candidate but our assessments can deliver clarity on whether the investor can meet the demands of the level of role he/she is applying for, discover what support or development they need to perform at their best, indicate what kind of team environment they will function best in and what their potential is to grow within the Firm. Working in PE in the long term can produce generation changing wealth but as investors progress through any firm it is vital to ensure that talent is rewarded fairly, that your bonuses and incentives are aligned to the behaviour and performance you want and that carry schemes work in the way that they were intended – offering long term incentives for those who make the greatest contribution to returns. Benchmarking on its own is not enough to ensure that the Firm has a competitive offering. Recognising generational needs and ensuring that total rewards match investor’s life stages is equally important. PB PE’s specialist consultants offer a holistic and confidential review service enabling you assess and make changes in this vitally important area. Organisation design is a critical – and often overlooked – element of people strategy as it focuses attention on whether you have the right people working in the right way to deliver the business strategy. The way activities are structured and managed is critical to success and will often need to evolve as business strategy develops. People Business uses organisation structure reviews to stimulate debate about how activities and responsibilities should be allocated to maximise future financial performance. Professional development is important not only in ensuring that future leaders and managers have the necessary skills for success but also in increasing the commitment of employees and improving retention of those with the greatest potential. In many ways, professional development is just as important as new recruitment. Failure to adequately develop talent throughout the organisation not only increases undesirable (and expensive) employee turnover but fails to take advantage of a major opportunity to generate value. Between them, recruitment and professional development are at the heart of generating value through people. People Business has substantial experience in the specific challenges of developing highly intelligent and very busy private equity executives. We design and run tailored talent development programmes, aligned to your strategic objectives. Coaching and mentoring merit special focus as a key component of talent development – and programmes can be effectively run even in the absence of a comprehensive talent development programme. Around the world there is increasing acceptance of the importance of individual coaching and mentoring for business executives – not just at Chief Executive or Director level but also for the most talented junior executives. A survey of Fortune 500 CEO’s found that 75% cited mentoring as one of the top three key factors in their career. Coaching and mentoring is a key component of talent management both because it is highly effective and because it is greatly appreciated by employees who see it as strong evidence of the company’s commitment to their development. It can certainly contribute to minimising (unwanted) employee turnover. Just as importantly it can be a highly cost effective way of generating value through people. Increasingly outstanding success depends on the effectiveness of teams rather than individuals. The team could be the Board, a function, a cross-functional project team or the whole company. People Business specialise in designing and delivering bespoke team development programmes. These vary greatly in nature depending on the objectives of the team, the starting point and the amount of time and budget available to invest in the team development programme. Some have a large element of business content, some focus on getting totally away from day to day business, some include individual and / or team psychometric evaluation. Good team development depends on great design as well as great delivery. People Business focus first on gaining a good understanding of the current state of the team and its future objectives and then build and deliver effective and enjoyable programmes. Each private equity company has its own strategy for supporting their portfolio companies. It is important to review this strategy from time to time and also to ask if the strategy ids being executed in the most effective way. 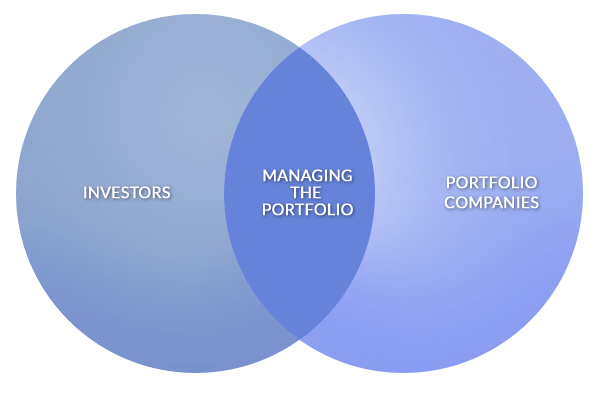 Decisions on how the portfolio should be managed have major implications for the roles and responsibilities of investors – inevitably influencing both the skills need by investors – and their recruitment and talent development. Many private equity companies have growing teams responsible for supporting portfolio companies. This trend has developed as improving operational performance has become a more important factor in value generation. Clarity on the role of these teams is essential if performance is to be maximised through effective recruitment and talent development – and design of the support programmes they manage. There are often widely varying views within a private equity company as to how people management activities should be handled and People Business PE helps companies to debate these issues and develop the best possible people strategy to deliver the overall business strategy. The Board of a private equity portfolio company is very different in nature from that of a public company – or an owner-managed private company. Being a Board Director is very different from other aspects of the private equity investor role. It requires an understanding of issues which may not have been critical factors in the pre-deal stage. The relationship between CEO / Founder and the private equity company is critical to the success of the investment. Founder CEO’s offer a particular challenge as they experience a major change of status and authority following a PE investment. The investment may also have changed their personal financial situation and consequently their attitude to a number of issues including work-life balance. PB PE design and run courses which helps private equity investors to build effective relationships with CEO / Founders. Courses are tailored to the specific needs of your PE company and reflect the fact that each company has a different approach to their management of portfolio companies. While investment strategies vary greatly, all PE companies have some similarities between their portfolio companies. In most cases they are fast growth companies who face common challenges of growth. There are also a number of common opportunities offered by new technologies and management practices such as AI, machine learning, big data and agile working. The PE company can help their individual investments to gain the benefits of these opportunities in a way that would not be affordable to each one on its own. McKinsey have recently emphasised the substantial productivity gains that can be achieved from modern procurement practices and this is certainly another area for potential synergies across portfolio companies. People Business PE helps PE companies to define the extent to which they want to seek synergies across their portfolio and helps them develop operational practices which enable the benefits to be achieved without unduly limiting the independence of each individual investment. Most PE companies are looking to benchmark their portfolio companies to help them assess areas of excellence and areas of potential improvement. PB PE helps PE companies to identity and implement benchmarking in a way which is consistent with their strategy for managing their portfolio companies. CEO’s of portfolio companies face many similar challenges – not least the fact that it is always lonely at the top. Some private equity companies have therefore set up “peer” groups made up of CEO’s from their portfolio companies. This has been extended in some cases to Groups of CTOs, CFOs, Sales and Marketing, HR etc. The peer group enables each Chief Executive to learn from the expertise of others in the Group, provides a confidential space to discuss problems and concerns and helps overcome the isolation from being alone at the top. Critical to the success of these groups is effective facilitation and management. Much preparation is needed to ensure that maximum value is obtained through the Peer Group and often the CEOs benefit from some 1 to 1 assistance / discussion with the facilitator. The success of these peer groups depends on building rapport / breaking down barriers so that people open up, actively contribute and – critically – take action after the sessions. People Business PE can facilitate such groups and ensure that the maximum benefits are achieved. We can work with the Chief Executives to prioritise topics of interest and where appropriate identify internal or external presenters. Delivering an acceptable return on investment usually depends on maximising growth. This is best achieved by designing and implementing a growth plan. Evaluating the company’s current levels in the core capabilities that drive growth and developing plans to address any areas of low capability. Ensuring that the management reporting process focuses sufficient C-level attention on growth. Post-acquisition, PB PE can help to turn the growth strategy into an operational plan and management process in which all aspects of people management are set up to maximise the successful execution of the strategy. Establishing a high performing Board team can make an enormous difference to investment returns. Whilst there is always a healthy tension between executives and their PE owner getting the Board team to work transparently together so there are no surprises, ideas are exchanged and acted upon and quality decisions made in a timely fashion isn’t easy. A great Chair and effective non executives play an important part transforming the way the Board works but is challenging when there is a significant agenda of business as usual activity and transformational change. Work with Chairs and Non Executives to help them fully execute their role navigating between the investor’s and executive’s goals. This is often the most important challenge within portfolio companies. No-one would dispute the critical importance of successful recruitment. No business can grow rapidly and successfully without the right people – especially at the top of the organisation. People Business uses organisation structure reviews to stimulate debate about how activities and responsibilities should be allocated to maximise the potential for the business strategy to be achieved. Developing a winning culture is critically important to fast growth companies. . Culture can be difficult to understand and define but includes factors such as results focus, innovation, communication, agility, collaboration, and mission and values alignment. As companies grow, they have significantly different HR needs. PB PE have experience of working with companies of all sizes and can help portfolio companies transition as requirements change, including the development of new HR policies where appropriate. We can also help with the recruitment of in-house HR professionals. Talent development is important not only in ensuring that future leaders and managers have the necessary skills for success but also in increasing the commitment of employees and improving retention of those with the greatest potential. In many ways, talent development is just as important as new recruitment. Failure to adequately develop talent throughout the organisation not only increases undesirable (and expensive) employee turnover but fails to take advantage of a major opportunity to generate value. Between them, recruitment and talent development are at the heart of generating value through people. Great businesses do not just require great leaders they need great managers. People Business has substantial experience using The Good Boss Model to develop outstandingly effective managers. Good Boss improves individual and organisational performance by focusing on how bosses manage their employees. The approach is very much results focused. Our research and recent experience have clearly demonstrated that one of the most effective ways to reduce costs and drive better performance in any organisation is to increase the effectiveness of bosses as managers of people. A particular attraction of investment in this area is the “multiplier” effect that it generates: an investment in developing the management skills of bosses is also directly aimed at delivering improvement among all their direct reports. The benefits can be even greater within portfolio companies. Senior executives have to run rapidly growing organisations and often have limited leadership and management experience. Coaching and mentoring can also be particularly useful for specialists such as in Finance, Technology or Manufacturing who are taking on broader management responsibilities. The Chairman of a PE-backed company will perform a mentoring role but there are usually limits to the scope of this. There are many issues that some Chief Executives will feel uncomfortable discussing with their Chairman who they see as both their boss and their link to their owners. In addition, discussions with Chairmen should be strategic in nature and CEOs value support with more operational issues as well. We have a PE mentoring framework for rapidly growing portfolio businesses – this ensures that important and relevant topics are discussed. This includes a “1st 100 days” section which highlights critical issues for the 3 months immediately after an investment. There are so many people management development opportunities that it can be difficult to know which will deliver the biggest benefits. The audit will involve structured interviews with 8 to 10 key people and a report identifying those activities which are likely to generate the greatest return. This audit can be adapted or expanded to meet your needs. It would create a strong foundation on which to decide what future investments in people management activity should be made. People Business PE has experience across the full range of HR activities from strategy through policy to administration. This makes us well placed to do rigorous management due diligence as part of the acquisition evaluation process. We recognise that the nature of Management and HR DD will be heavily influenced both by your attitude to working with existing management and by the extent of access to management during negotiations. We recommend that a bespoke Management and HR DD plan is agreed at the very start of due diligence. This plan would reflect the deal thesis / VCP, attitude to working with existing management and the anticipated level of access to them. It would identify the key HR issues specific to the acquisition and the best ways to evaluate them. Clearly the most important aspect is assessment of the potential of the senior management team as this will affect both the investment decision and the make-up of the post-acquisition management team. People Business PE has substantial experience of evaluating senior management including the use of psychometric profiling. The nature and extent of Management and HR DD will also obviously vary according to the nature of the business. Services businesses with large numbers of people require a very different approach to high tech businesses. All due diligence projects however need to identify any risks ranging from disputes / litigation to high employee turnover and low employee engagement. Ideally Management and HR DD should be closely linked to post-deal activity. There are advantages to some of the same people involved in due diligence being involved in post-deal people strategy and implementation. Good HR due diligence should provide the basis for a future people strategy for the first 2 years post-acquisition. This enables the newly acquired business to make rapid progress as it enters a new growth phase. This people strategy should cover all aspects of people management but especially recruitment requirements, organisation design, training and development and culture / employee motivation. Where practical, the due diligence process should also identify the likely internal reaction across the company to a change of ownership and the steps necessary to avoid unwanted employee turnover and to create a well-motivated workforce. Often the senior management of the recently acquired portfolio firm, having naturally been focused on the investment itself, will have low awareness of the potential impact of the investment on their own employees. People Business have substantial experience of both pre-deal Management and HR DD and post-deal support, including the development of operational growth plans to deliver the new post-deal strategy.